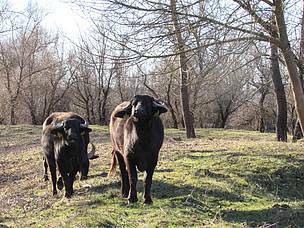 Budapest - As winter is coming, the eight water buffalos of Tiszatarjan have returned to their winter residence from their floodplain pasture. With the help of WWF, the 11 hectares area is being “cleaned” from invasive Amorpha species by the local community and used as a grassland for long horned Grey Cattle and water buffalos. Working together since 2007, Tiszatarjan and WWF have established a unique, climate change adaptation model, next to the River Tisza in north-eastern Hungary. The project accelerated a process in disadvantaged marginal village communities to reduce climate change vulnerability through the utilization of invasive plant species as bioenergy source while diversifying local income streams. In addition, this project also has contributes to biodiversity conservation. As a result of this partnership the cutting of invasive Amorpha species offers an income to the local community, while the local public buildings, such as the local school, nursery or Community House is being heated exclusively by the small-scale boilers that burn the biomass WWF and the village of Tiszatarjan built up a partnership and started to cut wild bushes of the highly invasive Amorpha species, which has been burned in local, small-scale boilers to produce `green energy ́ for the public buildings. The area was a beautiful mosaic of sparsely forested floodplain grasslands wetlands (e.g. oxbows) and floodplain softwood forests. Many landscapes and species remain, but far less in number than before. A large part of the area was nationally protected as a park, and internationally protected as a Ramsar wetland site. Key species include globally significant species such as Black stork, White-tailed Eagle, Saker Falcon, Eruasian Beaver and countless water birds that migrate to the area in the spring including herons and geese. The area is especially noted for its `Tisza Flowering ́, the mating dances of a Mayfly each June which create a breathtaking immense cloud of swarming and mating winged species for only a few days. Water buffaloes in their winter residence. WWF-Hungary survey: Who cares about nature?